From trend-setting cuts to luminous color, our full-service salon is staffed with educated and experienced stylists each trained to understand your style goals. The stylists at Gayle’s Salon & Spa transform hair using the latest, proven techniques. From cuts and curls that redefine your shape, to color and highlights that refresh your hair’s ambiance, to smoothing treatments and hair extensions for luxurious silky length, hair is our passion, and you-our focus. Silky and smooth hair can be yours with your Brazillian Blow Out. This in-salon service infuses Keratin deep into the cuticle of the hair. Your hands are important areas that need special attention. Our personalized manicures leave yours feeling soothed and refreshed. Whether you like natural nails or want to add that bright summer shade, your nails won’t go unnoticed. Soft, silky hands are a pleasure to touch and to look at and that makes a great first impression. We will shape your nails, gently push back your cuticles and polish with your favorite color. A new fresh start in minutes! This ultimate hand pampering includes shaping your nails, cuticle care, a hand and lower arm massage and your color of choice. This supreme experience includes a warm hand soak (optional) and an invigorating sugar exfoliation on your hands and forearms. A mask is applied followed by a hot steamed towel wrapping your hands to get the ultimate hydration. It also features extended nail shaping, cuticle care, buffing and a warm cream hand massage. Top it off with long-lasting polish of your choice. Our pedicure niche was designed with serenity in mind. Let our copper basin pedicure bowls and leather chairs embrace you as your tired feet are revived while you relax and enjoy the woodland view through your own personal picture-window. Your flip-flops will love you! Refresh your feet and toes with a relaxing hot towel wrap followed by nail shaping and cuticle care. Choose your favorite polish for a professional finish. Delight in a refreshing soak followed by nail and cuticle detailing, scrub exfoliation, foot filing for heel care, foot and leg massage with moisturizing lotion and finished with the polish of your choice. Indulge your feet in our warm foot bath, followed by nail and cuticle detailing, scrub exfoliation, foot filing for heel care and an extended foot and leg massage with moisturizing lotion. Wait, we’re not done. We add a hydrating mask and wrap your feet in steaming hot towels followed by a soothing cucumber heal treatment to repair cracked or rough heels. Finished with the polish of your choice. Whether your skin is in need of a splash of hydration or you would like to see improvement in the texture and tone of your skin, you are sure to love the results and therapeutic benefits of our spa facials. Our skincare professionals perform skin cleansing and age-defying treatments that will leave your skin vibrant and healthy. Your skin will be cleansed, exfoliated and toned before the nutrient-rich lip and eye mask is applied. as the mask is applied in layers and your skin is soaking up the hydrating fluid, you will enjoy a firm, relaxing head massage. the treatment is finished with a healing serum and, again, layered with cream specific to your skin type. All of our custom classic facial include a deep cleanse, hot towel treatment, exfoliation, extractions, toner, neck and shoulder massage, mask, eye cream and moisturizer specific to your skin care needs. For dry or dehydrated skin, this hydrating treatment is designed to increase the skin’s ability to create water reserves and protect your skin from dehydration. The heart of this treatment’s formula is a pool of active ingredients which ensures a precious hydro-regulating and protecting action. You will find instant comfort, and your skin will be nourished, soft and radiant. Working to turn back the signs of time, this treatment protects the natural content and firmness of your skin, ensuring constant nourishment and protection. The exclusive active ingredients, Omega 3 and 6, Ceramide III, Sugars and Amino Acids, work to optimize the vital functions of your skin, assisting to reduce wrinkles, while improving tone and elasticity. Revitalize you skin! Specifically developed for skin which has a tendency to develop acne, this purifying facial treatment controls sebaceous secretion. As it reduces these excess oils, your skin will be less shiny while the active ingredients also work to control bacteria. You will notice reduced pores and blemishes and skin that’s fresh, even, balanced and moisturized. This treatment works so well for irritated, inflamed or delicate skin. With its softening and restoring properties, Sweet Relief provides comfort and freshness to your skin, increasing its resistance against external aggressions. The heart of the formula is a special hydro-soothing pool of active ingredients that offers protection and strength for your sensitive skin. Relief is just a facial away! This extremely soothing treatment is recommended for delicate, hyper-sensitive or redness-prone skin. DESENSÉ is a highly concentrated, restoring facial that soothes and repairs fragile skin conditions as well as reducing your skin’s inﬂammatory reaction. It restores your natural barriers through application of moisturizing mask, nourishing cream and calming serum. Do you have uneven skin tone, problematic skin or skin needing a radiance boost? Renew your skin by reducing fine lines and uneven pigmentation while opening pores and improving texture. New generation AHA’s, PHA’s and a whitening complex provides the skin with renewed splendor, leaving it smoother and clearer. It gives a gentle, but effective, peel treatment for skin lacking radiance. Enjoy this facial as a stand alone treatment or book a six week program to maximize the results! schedule six treatments to maximize the results and save 10%! For your face, this is a gentle, yet extremely effective, skin-resurfacing treatment. Microdermabrasion instantly rejuvenates and lifts tired skin, and can improve lines, wrinkles, acne scarring and pigmentation problems. Microdermabrasion is a safe, controlled way to deeply exfoliate skin using a flow of crystals to superficially peel the Stratum Corneum. This treatment includes cleansing. microdermabrasion, face mask, scalp and shoulder massage and is finished with a moisturizing cream. schedule four treatments to maximize the results and save 10%! This technique is also very beneficial for your back. A result driven back treatment using microdermabrasion will reduce the appearance of scarring, blackheads and milia. Relax, repair and rejuvenate with a tension-eliminating massage or invigorating body treatment. 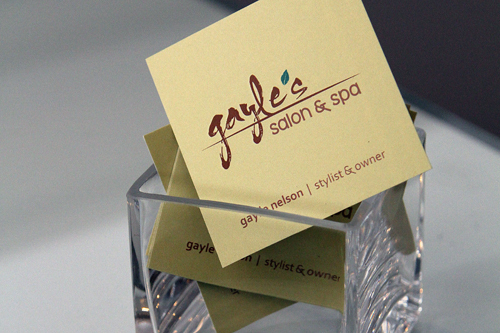 The massage therapists at Gayle’s Salon & Spa are experienced with everything from Swedish to hot stone; we have the massage to make your stress a thing of the past. When your back, shoulders and neck just ache from tension and stress, we have the fix for you. This massage is focused on only these areas and will give you welcome relief. We customize the depth of pressure, so it’s just right for you. After a few minutes, you’ll fell all that stress just melt away as your muscles relax and your mind calms. It’s your turn to take a break. The name says it all. This massage encompasses all the muscle groups and can be customized with varying pressure and extra attention where it’s desired. You’ll love the hot towel neck wrap too. You can request Swedish, with fluid muscle pressure, or deep tissue, a more focused massage to release deep muscle tension. Relax and enjoy. This massage is pure relaxation. Close your eyes and let your tension drift away as the gentle, flowing strokes and tissue release techniques refresh your body and your mind. Enjoy the hot towel neck and foot wraps while the therapist focuses on melting away your cares. This massage includes a sugar scrub of your back followed by a hot towel cleansing. This luxurious experience is the ultimate in stress reducing massage. It’s time to de-stress. Indulge in this age-old therapy as heated basalt stones are used to massage and penetrate deep into muscles relieving tension and generating a feeling of total well-being. is extremely effective in easing the stress on your body during pregnancy. By allowing your body to relax, this also creates a relaxing and nurturing environment for your growing baby. Available in second and third trimesters only. Reflexology works to stimulate and balance all the zones of the body while providing a relaxing foot massage, allowing for deeper relaxation of the entire body. Body treatments are essentially a facial for your whole body and leaves your skin feeling velvety smooth and soft. The idea behind a body treatment is that it’s just as important to cleanse, exfoliate and hydrate the skin on your body as it is the skin of your face. The most popular body treatment is a body scrub, sometimes called a body polish, sugar glow or sea-salt scrub. This exfoliating treatment takes place on a massage table covered with a proteective sheet. This treatment begins with a salt scrub exfoliation followed by a hot towel cleansing. Dead Sea Body mud will be applied with a brush then you will be wrapped with a mylar blanket. cocooned in this indulgent, healing and hydrating mud, you will be enveloped in layers of warm blankets. During this soothing wrap, you’ll enjoy a scalp massage followed by a shower in privacy. A coconut oil massage will complete your treatment. Your skin will feel refreshed, toned and luxurious. Don't let the hart address fool you! Just minutes from pentwater!